Barrette Structural Distribution, the manufacturer of open joist TRIFORCE®, is committed to educating current and potential customers about engineered building components. This Blog is an example of Barrette Structural Distribution’s efforts to inform and, admittedly, to highlight the benefits of using TRIFORCE® joists. Now, the company has taken an additional progressive step as an educational resource for the building industry. Barrette Structural Distribution now offers an online AIA/CES course for credit, accessible on the TRIFORCE® website. The course is entitled “Evolution of the Wood Floor Joist” (English only). It follows the prescribed format for American Institute of Architects Continuing Education but is also structured to provide useful information to anyone considering, designing with or building with engineered components. Certificates of Completion are available to those who are from the U.S. and complete the online course. 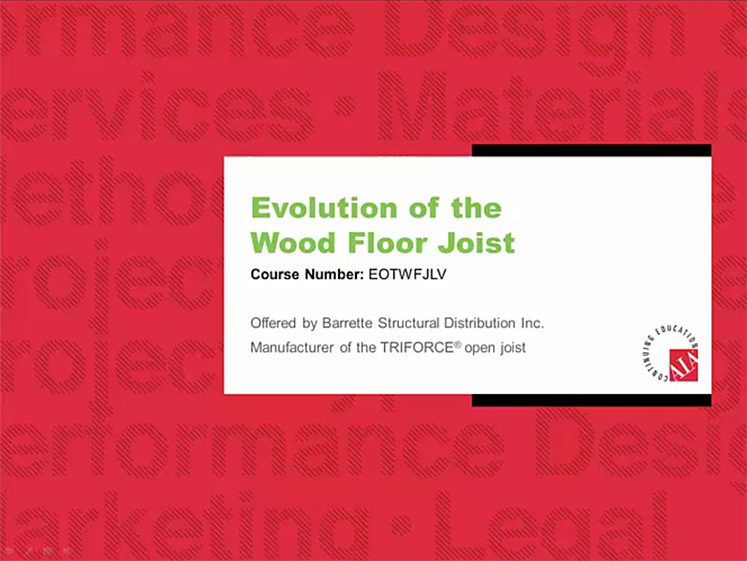 The video outline for “Evolution of the Wood Floor Joist” follows a logical path that begins with the interesting history and development of engineered wood components. It discusses the impact of these products on modern building practices and construction design. Importantly, the course points out the options today’s design professionals have available when specifying floor system structure. The need for designers to consider comfort factors as well as safety factors is addressed. This leads naturally to a discussion of floor system performance and measures that can improve such. Within the presentation, recent engineered component breakthroughs are highlighted. “Evolution of the Wood Joist” is recommended for anyone designing wood floor systems. For professionals based in the U.S., in addition to the online version of the course, and under certain criteria, in-person presentations can be delivered by certified representatives of Barrette Structural Distribution and the company’s TRIFORCE® Master Distributors. To explore the online version, go the “Continuing Education” section of TRIFORCE® website. Take advantage of this industry education opportunity today! TRIFORCE® open joist… Peace of mind underfootTM! As the Program Director here at Barrette Structural, my job is to make sure we get the word out about how the TRIFORCE® open joist can help improve the quality of your projects and reduce your TCO. In this blog, I’ll be discussing market trends and innovations, as well as sustainability. I will also bring you the latest news about our team!